"The Situation. 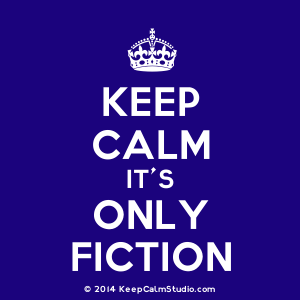 It was all part of the one Situation, after all." The more Highsmith I read, the more reluctant I become to label her work as crime fiction. The problem in trying to categorize her work is that she's a writer who doesn't pigeonhole easily, so I have just quit trying. But since there's murder involved here, as in most of the books I've read (with the exception of her The Price of Salt), this seems like the appropriate place to talk about her work. 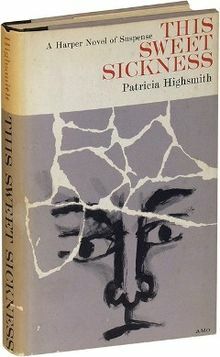 This Sweet Sickness is Highsmith's seventh book and somewhere around page 90 I had to put it down for a day because of the knots forming in my gut. Somehow I just knew that this story was going to end very badly and well, I wasn't wrong. This book unnerved me to the max and reaffirmed my belief that it is dangerous indeed to stay in this woman's brain (or that of her main character here) for any length of time. "was the way it was and had been for nearly two years...like a rock, say a five-pound rock, that he carried around in his chest day and night." David's "situation" is that two years earlier, Annabelle had married Gerald Delaney. That doesn't seem to bother David, though -- in his mind, he had "won Annabelle," who, in Neumeister's house, "lived with him here, he imagined," "her presence in every room." Everything he does is for Annabelle, and his obsession with her grows as he pursues his dream of having her as his wife. Andrew Wilson, Highsmith's biographer who reveals that Kelsey is a sort of "Nietzschean hero," which should come as absolutely no surprise to anyone who's read Highsmith. He also reveals that Highsmith herself "conducted an imaginary love affair," and notes Highsmith's diary as recording that "without her" (the woman about whom she fantasized), "it would have been a different book." 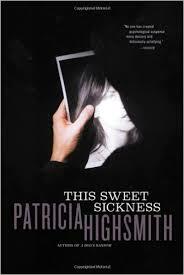 Quite frankly, This Sweet Sickness is one of the most disturbing novels in Highsmith's lineup to this point, and reader beware -- there is absolutely nothing uplifting or redeeming to be found here, which normally doesn't bother me, but with Highsmith I've found that reading her work has to be done in small doses. I'm totally not surprised that Hitchcock bought the television rights to this book, which eventually became an episode of The Alfred Hitchcock Hour called "Annabel" (season one) starring Dean Stockwell. Maddeningly, I can't find a copy to buy anywhere, nor can I find anything but a VHS copy of the movie based on this book (1977) starring Gérard Depardieu, "Dites-lui que je l'aime." Enter at your own risk, but then again, that's true of every Highsmith novel. Her books definitely get an NFE (not for everyone) rating from me -- but I can't help myself. I love her. Oh my god, Skye, I accidentally deleted your comment! I am so sorry! You know I love you.